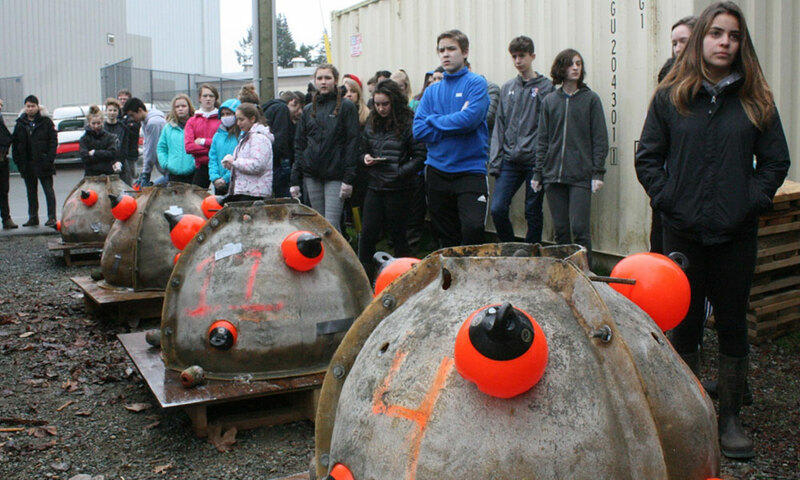 Feb. 8, 2018 6:00 a.m.
High school students crowded to push and smash wet concrete into a quartet of fibreglass-framed reef balls on Wednesday. 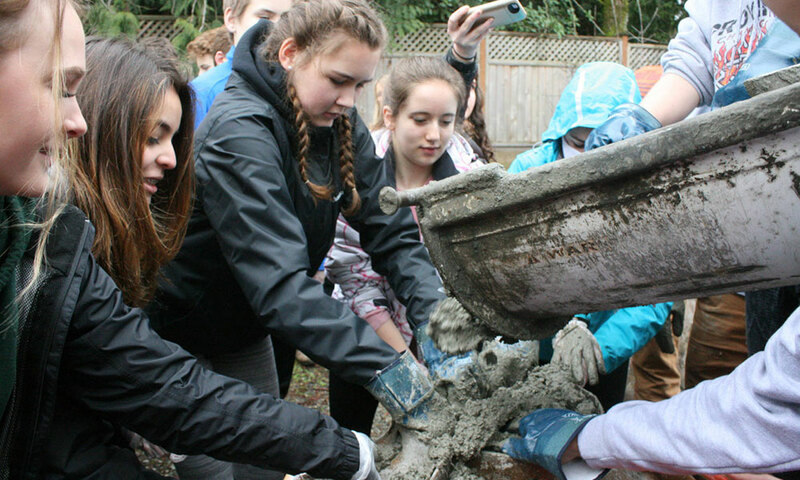 Despite wearing heavy duty gloves, Grade 9 students from Claremont’s International Global Studies ended up with concrete on their clothes as they guided the concrete, pouring out of a Butler Bros. concrete mixer, into the one-metre wide frames. Inside each frame is a recognizable orange buoy. The concrete dries into a ball around the buoy, and the buoy is then removed as the balls are placed into the seabed. Today is the day we add [concrete] but we’ve been learning about the [reef balls] and where they’ll go, what they’ll do, for a few days now,” said student Grace MacMaster. Once the concrete is dry the reef balls will be dropped into a “dead zone” on the west side of the Victoria International Marina. It’s an idea from the company behind the design and construction of the marina, said Eric Li, director of lifestyle and technology with VIM. As the engineers who helped install giant wind turbines into the ocean floor of the North Sea have learned, the more infrastructure that’s available, the more sea life will attach itself and grow. In the North Sea, mussel populations booming. Here in the Inner Harbour, it’s the usual variety of small fish, which are starting to invite predators, Li said. “We have seals coming through and we’re hoping to host salmon fry in a net pen, if we can get permission,” Li said. Once the reef balls settle Li said they’ll consider adding up to 15 to create a reef.